When is the last time you read the label on the back of a skincare product? 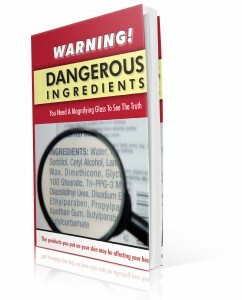 Did you ever question what the ingredients were, or if they were safe for your body? Could you even read the label, or didn’t you bother, given that the print was so small that you needed a magnifying glass? More than likely, you couldn’t even pronounce the ingredients when you were reading them. Maybe you really were concerned with finding a safe, healthy product, so you bought something with “Natural Organic” ingredients advertised on the front label (or box) and assumed the product was safe. Did you read and fully understand the label on the back? We use various products on our skin every day; from deodorant, to moisturizer, soap, perfume, aftershaves, and sunscreen, etc. Before a typical person (male or female) has had their breakfast in the morning, they often expose themselves to over 100 various chemicals. We tend to think that products we put on the surface of our skin stay on the exterior of our body. The skin that protects us also absorbs what we put on our body. Therefore, our body can be nourished from the skin with healthy ingredients or harmed by exposure to harmful chemical ingredients. We would never think of taking these chemicals orally, but by putting them on our skin, we are taking them in nevertheless! The largest organ of the human body is the skin. This organ is an amazing two-way membrane. Toxins are eliminated through the skin via perspiration, and absorbed through the skin into the body’s circulatory system by hair follicles and sebaceous glands. 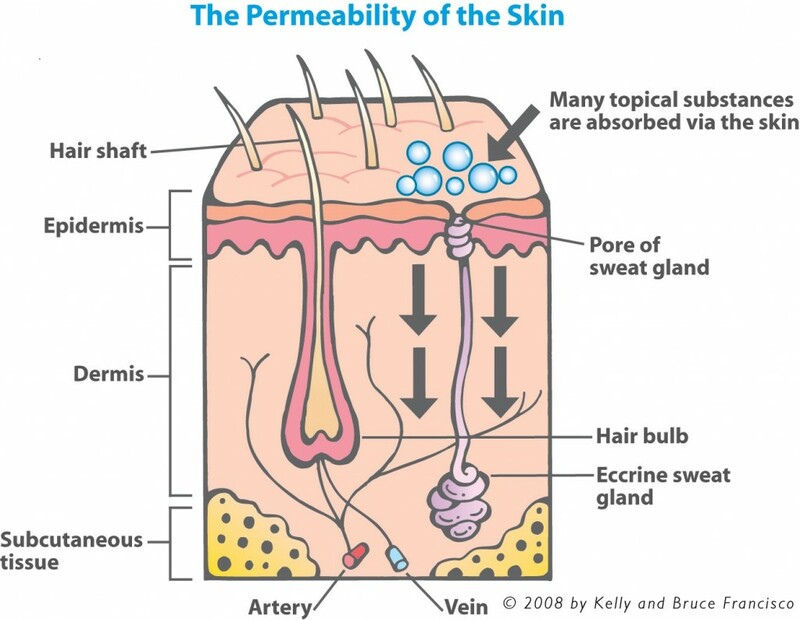 Every square inch of your skin has hundreds of pores, absorbing into the body most of what is put on it. However, people are set in their thinking that the skin is outside of their body and therefore feel safe with this “barrier of protection” which they believe is not vulnerable to invasion. Most skin creams and beauty products contain parabens in the form of propyl, methyl and butyl. The parabens are known to be xeno-estrogens (xeno – a Greek word for foreign), yet your body recognizes it as estrogen – (we’ll explain this later in detail). These compounds are now being investigated by the European Union as a likely contributor to breast cancer. Because it is a known medical fact that our skin is permeable; there is rising concern that many of the chemicals that skincare and make-up manufacturers use are linked to many health problems including hormonal imbalances, neurological disorders, immune system diseases, cardiovascular diseases, prostate and breast cancers, and childhood health problems to name a few. Wouldn’t it be prudent to educate oneself about the possible consequences of using products with harmful chemical ingredients? * You will receive a paperback book, snail-mailed to the address you supply, shipping $8.50 only charge. Parabens are chemical preservatives added to personal care products to extend shelf life, and are widely used in tens of thousand types of cosmetic products today. Four main parabens are in use: methyl, ethyl, propyl and butylparabens; many products will have 2 or more of these chemicals as part of a preservative system. Parabens are cancer causing and estrogenic and found in breast tissue, possibly stored in fat tissue. A solvent and denaturant, derived from petroleum and used in anti-freeze, and as a solvent in shellac. This ingredient also has the ability to change other substance’s natural qualities. A petroleum based ingredient that is acne producing, may be carcinogenic, and cause dry skin. Because the oil coats the skin like a plastic wrap, inhibiting the skin to breathe and absorb essential moisture and nutrition, it is unhealthy. Baby oil is 100% mineral oil, and disables the skin from releasing toxins, which may lead to other disorders of the skin. A known carcinogen. PEG is an abbreviation for polyethylene glycol. It is used in the manufacture of cleansers to dissolve oil and grease. PEG’s tend to strip the natural moisture factor, leaving the immune system vulnerable. This ingredient is actually the active element in antifreeze. There is no difference between the PG used in personal care products, and the PG used in industry. Added into cosmetics as a wetting agent and surfactant, PG causes contact dermatitis, allergies and acne. SLS is possibly one of the most dangerous of all ingredients found in personal care products today. Used in industry in compounds to create car wash soaps, garage floor cleaners, and engine degreasers, studies have implicated SLS in damaging the immune system, SLS easily penetrates through the skin and enters and maintains residual levels in the heart, the liver, the lungs and the brain. It is known to be carcinogenic. DEA, MEA and TEA are hormone-disrupting chemicals and are known to form cancer causing nitrates and nitrosamines, commonly found in most personal care products that foam, including bubble baths, body washes, shampoos, soaps and facial cleansers. DEA and MEA are usually listed on the ingredient label in conjunction with the compound being neutralized. Take note: Look for names like Cocoamide DEA or MEA, Lauramide DEA, etc. No manufacturer needs to list the chemicals used in fragrances. In fact, fragrance free doesn’t necessarily mean fragrance free, certain chemicals are added to products to mask the aroma of the ingredients. Fragrance is present in most deodorants, shampoos, sunscreens, skin care, and baby care products. Many of the compounds in fragrances are carcinogenic or otherwise toxic. Also, studies have shown some affect the nervous system causing depression, hyperactivity, irritability and other behavioral changes. Have you ever noticed when someone walks into your space with heavy perfume or cologne and suddenly you feel slightly nauseous? These preservatives release formaldehyde. Studies have shown exposure to formaldehyde may cause joint pain, allergies, depression, headaches, chest pains, ear infections, chronic fatigue, dizziness and loss of sleep. Serious side effects include weakening of the immune system and cancer. 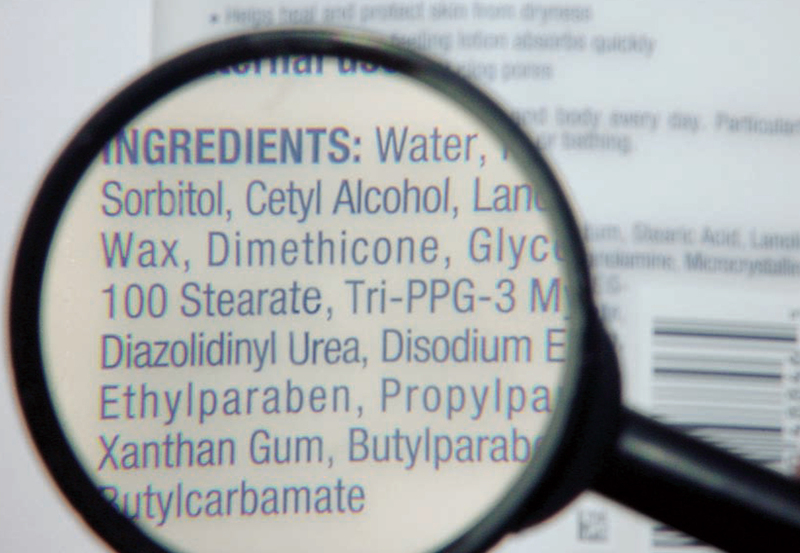 Many skin care and beauty products contain formaldehyde-releasing ingredients. Petroleum derived found in cosmetics and hair products and considered toxic. Widely used as a preservative in shampoos, creams, and also found in baby products. Prolonged exposure to low levels of methylisothiazoline (MIT) can have potentially harmful effects to a developing nervous system. Used in nail polish and cosmetics as a germicide and disinfectant. It is carcinogenic, banned in Japan and Sweden. Promotes breakdown of vitamins, such as Vitamin D. Endocrine disrupters and can contribute to elevated cholesterol levels. They are also carcinogenic. 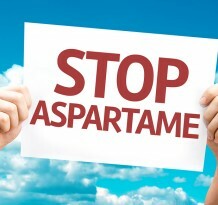 Can cause facial dermatitis and allergic response. Talc is linked to ovarian cancer and can contain asbestos. This ingredient was developed by the fabric industry as a fabric softener and is now used in hair products and creams. It is highly toxic. Used in skin lightening products. Hydroquinone is a well known carcinogen. It is very toxic and banned in Europe. Low level exposure is linked to cancer. Petrochemical. Possible carcinogenic. Caused tumors and mutation in lab animals. 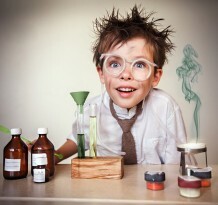 Chemical solvents used as softeners in plastics and used in cosmetics as a flexible agent. Researchers say that phthalates disrupt hormone function which may contribute to rising infertility in both male and female, and also uterine problems in women and can promote testicular cancer in men. The European Union has banned phthalates from cosmetics.